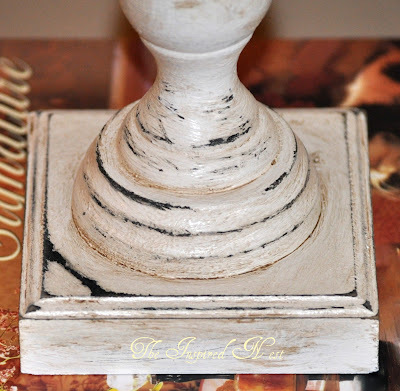 Here is the tutorial for my Pottery Barn Decorative Objects that I featured yesterday. it made me wonder why I didn't do this so much earlier??? 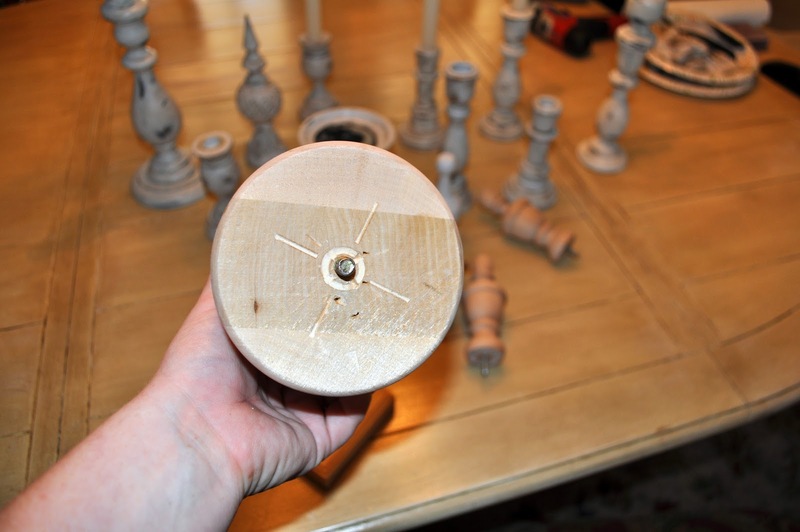 I had started putting the candlesticks together with the finials and started painting them and then just moved on to another project. I purchased the smaller candlesticks for 29 cents each at Goodwill. A few of the finals came from there as well. I had already started painting them when I remembered to take a before pic! This is the base for the largest finial. It is metal and started out black. The two pieces were attached with Gorilla Glue. The cup of the base is so deep that this took a lot of glue!! One end of these pieces had a screw and the other end had an opening. I enlarged the small opening with my drill and screwed the two pieces together. I did enforce the bond with Gorilla Glue. Here it is with 3 pieces put together. A untrained monkey could do this! 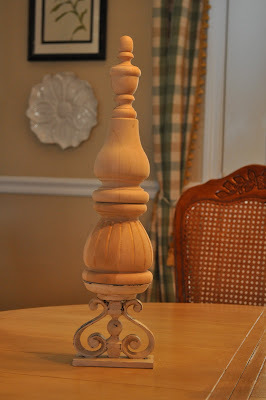 The other finials were simply glued together! Each pieces was spray painted black. 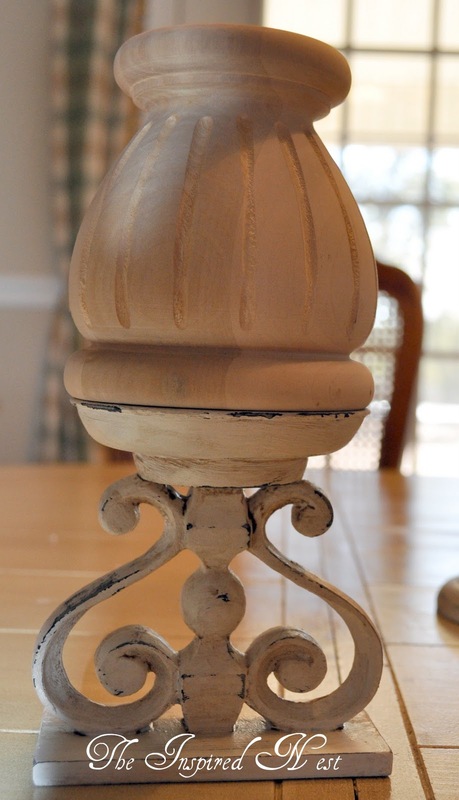 Once dry I went over it with a cream color spray paint. Next, I hand painted each one with a latex semi gloss paint. My paint choice is Valspar Angels. Once dry, I took 80 grit sand paper and distressed them until I liked how it looked. Glazing is the final step. 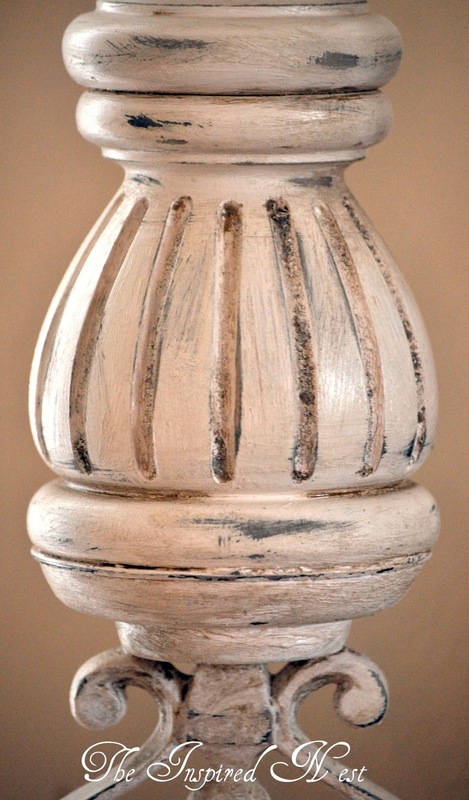 I slather the glaze all over the finial and wipe off slowly until I achieve the look I was after. I hope you will take a stab at creating a cheaper version of the catalogs we all love! I am not stopping here! Wow! TA DA is right!! What a great look! How clever of you to put all of those together - you have great vision! Love it. I love them! I can never find stuff like that at our Goodwill!!! Wonderful creativity. Thanks so much for sharing your tutorial! Now I just have to find such marvelous treasures! I love these...I was looking at my catalog and saw these then remembered you were going to have a tutorial. I couldnt wait to have the kitchen cleaned up for the night to get on here and see your post. They seem very simple to do and look just like Pottery Barns, great job and thanks! I love diy projects that save moolah. Very nice. That is an awesome tutorial, thanks! Those look awesome and what a great tutorial. I never find things like that at GW. Thanks for linking up this week! Wow!!!! Those are fantastic!!! I ams stopping by from Kim's and just wanted to tell you what a great job you did! I would love to try this! I love them! I can't wait for your next project. I know I have a lot of the things I need up stairs, and need some things for my new mantle. Thanks! It's like Legos for big girls! Love it! How clever and and I love how they turned out! Such character and I think I could actually do one!! Like Pottery Barn but only better! Love this idea - never would have thought of it!! Lacy, these are gorgeous. And it looks like you had fun combining all those shapes. I have a few finials that may have a new home soon. Great job! They look so expensive. Thank you for posting the tutorial so I can create the look myself. I love these! They look awesome!! I am definitely going to make some. I am now your newest follower. I look forward to following along. Come check me out if you get a chance. These are so gorgeous, I think I am definitely a monkey, and maybe I could do this. I love the final look and they are all so unique. Thanks for the step by step tutorial. I just helped glaze kitchen cabinets, so I ought to be able to do this! I am so glad I found this tutorial (and your blog!) What kind of glaze did you use? I love the finish! Love these! 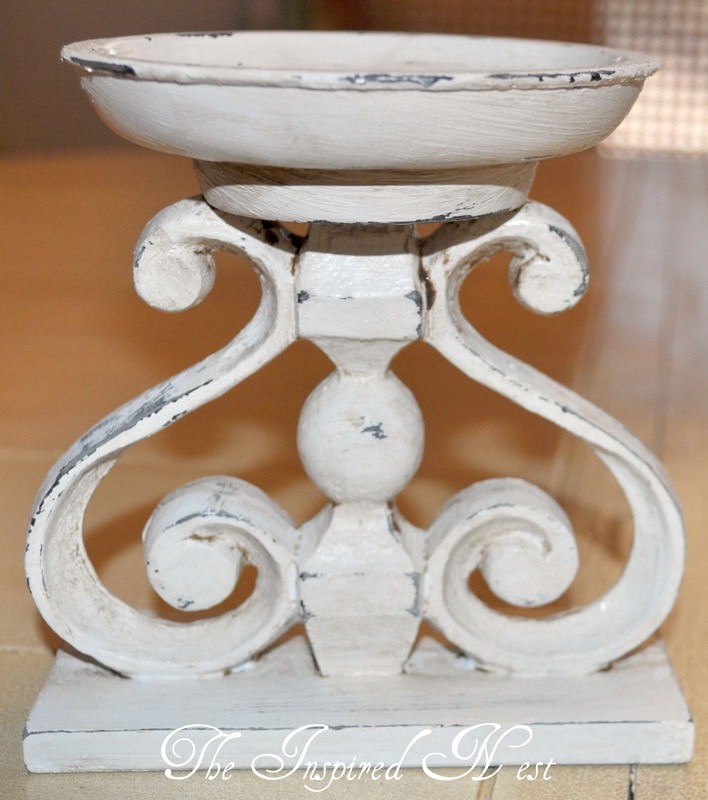 I featured this post on Scribbles and Swirls...I hope you like it. Please take a look and follow along as well. I adore how these look! Thank you for sharing! Amazing. I want to make some after seeing this. Found it on Pinterest. Great job and thanks! I know this was posted more than a year ago, but I just found it through pinterest. 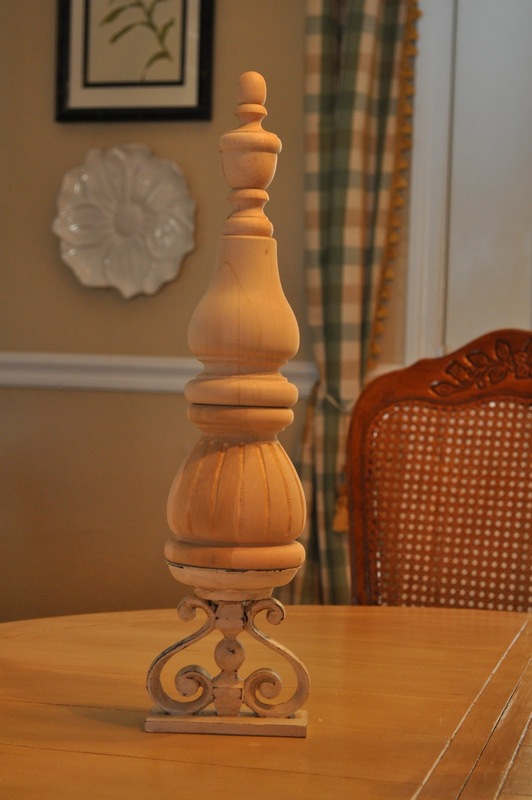 I have to tell you that your finials are fabulous! I could kick myself for getting rid of some pieces that would have worked for this last summer. Hi! I just found this post through Pinterest and it is brilliant! 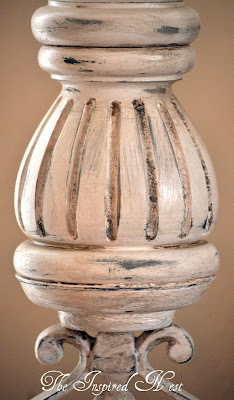 I love finding ways to recreate those Pottery Barn/Restoration/Anthro looks. Very cool. Love it and will be trying it soon!! 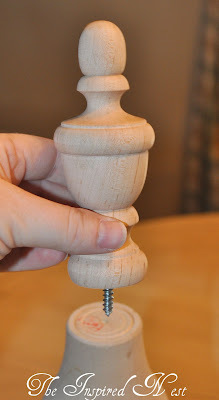 I'm posting a photo of this project and linking to your instructions. 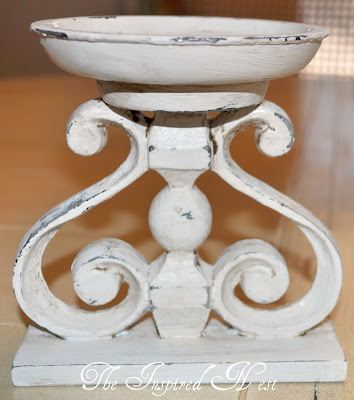 I just found a bin of wood pieces, and remembered this project...so I want to make some! The post will be tomorrow, 10/29/12. 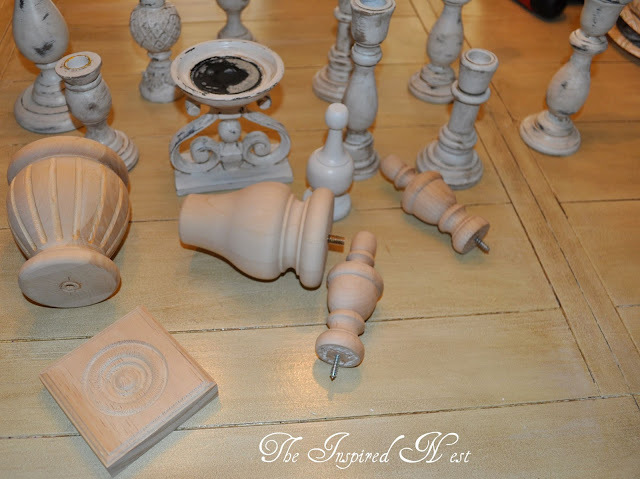 Making these finials is such a creative idea...You would never know they were made of separate pieces. I have listed your idea as one of my favorite things I saw during the past week on my blog at http://www.andersonandgrant.blogspot.com/2013/06/a-look-back-2.html . Great tutorial! I will put these on my to-make list! They look so high end. I would like to share them on my blog if you don't mind? What's Pink and Black & White All Over??? Furniture fit for a Princess! Valspar Power In Color Giveaway!